Plum Brook's pressure tank pictured in the first phase of shipment by railway. 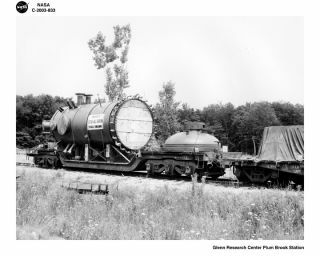 In this historical photo from the U.S. space agency, the pressure tank was shipped to Plum Brook via railway, and transported to the reactor facility on a flatbed truck. The tank was then rolled to a crane, which lifted it into place at the center of the unfinished quadrant area. Several pipes jutted out from the tank. These "test holes" would be used to transport experiments to the reactor core for radiation during its operating cycles.